Memorial Day. It seems at times but an open door to the warmth of summer. Especially on a sunny, Central California day. Though it shouldn’t, sometimes it takes the knock of a rainy or foggy Monday for us to answer the day as intended: to recall and hold up those that gave us so much and then left (and often left far too soon). The Leforts have been left with less and lost strength each time. We remember each loss today with welling sadness, but gratitude for their gifts. You too have many souls to recall and respect. As we do throughout, we reach for music to amplify and comfort. So we give you Elvis Perkins’ shattering Ash Wednesday and Clem Snide’s redemptive All Green. After hearing huzzahs straight from the horse’s mouth (multitalented former Santa Barbaran and musician/producer, John Askew), and after major Hail Mary tosses, we ventured down to Muddy Waters in Santa Barbara to catch Portland’s harmonizing Hosannas last night. The Hail Marys entailed last minute pitches to Mrs. Lefort for an impromptu drop-in to the Muddy to catch the Hosannas apres-dinner . 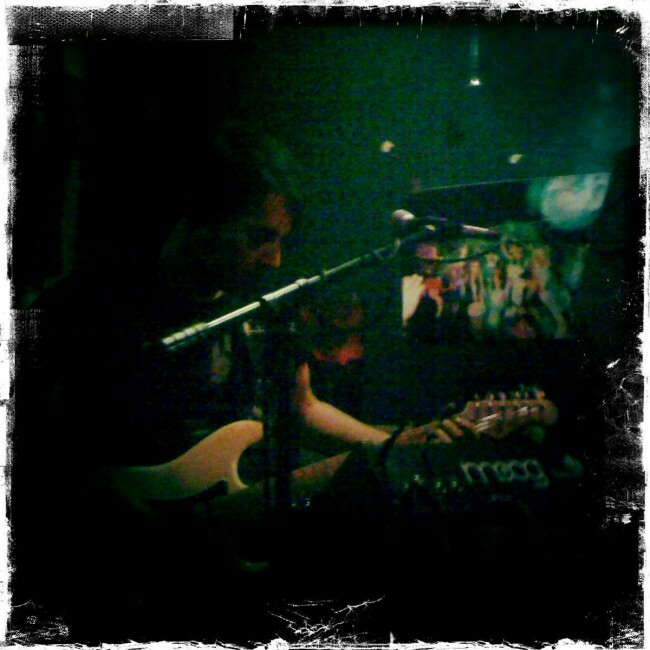 An early set-time and a hallowed day led to our harmonic convergence at the venue, and off we went to hear the Hosannas. It was miraculous that the band had even made it to Santa Barbara at all after being assaulted in the afternoon in Oakland earlier this week, resulting in a broken nose for Brandon Laws and a visit to the emergency room. In the tradition of the age-old mantra, “the show must go on,” the band played that night in the Bay Area and hasn’t missed a show since. Sporting a black eye to go with his broken nose, Brandon nonetheless played with energy and aplomb in Santa Barbara despite telling Lefort he was scheduled for a “re-set” of his nose today. Admirable. The Hosannas employ an eclectic blend of passionate, harmonized vocals, cleaving and clever keyboards and effects, multi-participant percussion (anchored by Lane Harrington’s complex rhythms), and Brandon’s stellar Gang of Four-meets-Pinback guitar playing. The net effect is avant-melodic, and a welcome change from more standard fare, recalling Grizzly Bear and Animal Collective at times, but with its own identity. The songs vary from borderline-precious (in a good way) to epic, and often all on the same song (give a listen to the prodigious Hidden Tone below). After a great set by raucous openers Boomsnake, Hosannas took the stage. With great appreciation for dynamics, the band followed the good-loud Boomsnake with a stunning acapella read of Golden Girls. The crowd stepped in closer to catch the talent-show and as a result, the band played to an enraptured audience for its entire set. We encourage you to pick up their “Song Force Crystal” recording from last year or their new, anthology-esque record, “Then and Now and Then.” And then get ready for their John Askew-produced third record expected out in September. Judging by the songs and talent in this band, and the Askew-add, it’s going to be epic. Check out their song Hidden Tone below and the videos of the band performing live. If you like what you hear and see, Hosannas will return from LA to play “Billy O’s” in Ventura Monday night (5/31). Be there. 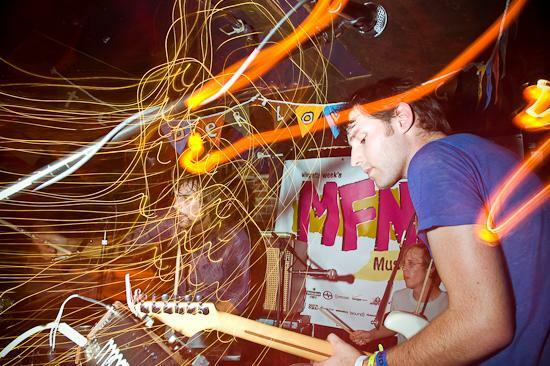 We caught the young band, Freelance Whales, on Wednesday spouting off at Jensen’s. The Whales are a talented, energetic group still in search of its sea legs, still evolving and looking for its own currents in which to thrive. We look forward to their growth and next visit to Cali. The band hails from Queens, NY, and carries with them an interesting pastiche of instruments (harmonium, banjo, glockenspiel, synthesizers, guitars, bass, drums, waterphone). 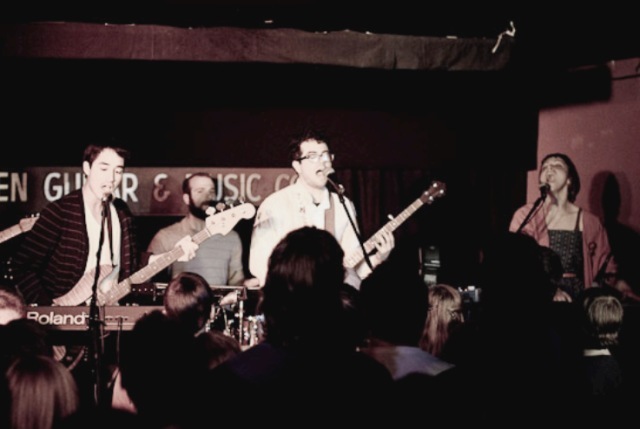 The five band members have crafted melodic indie-pop songs delivered with emphatic five-part harmonies, interesting rhythmic patterns, and an engaged group-vocal energy (just look at Doris Cellar above!). They were at their best on Wednesday when wielding their indie-choral attack on The Generator 2nd Floor, Ghosting and Hannah (though on the latter and other songs, we wish leader Judah Dadone could be more mic-focused to better realize the lyrics’ effect). The crowd really came alive on the much-played and popular Hannah, and then settled in for a solid set of sweetness. The band played musical chairs well too, with each member seemingly relishing their turn at the glockenspiel and other instruments. Like many new bands, however, the Whales wear their influences on their sleeves. But the better bands are less obvious about their idols and manage to make the sounds their own, and this band will have to quickly evolve and find their own way in the world. One hears heavy Death Cab (The Great Escapes, Kilojoules) worship, along with plenty of pangs for the Postal Service (Starring). And with inclusion of banjo and glockenspiel, the band does not hide the pull of Sufjan Stevens. 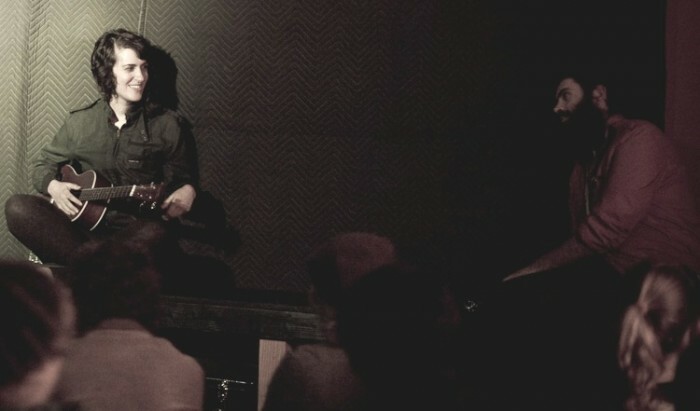 Regarding the latter, the band has regretfully crossed the line on Broken Horse and directly copied Stevens’ melody and motif in Steven’s masterwork, Casimir Pulaski (listen for yourself below). Come on Whales! We trust the Freelance Whales will find their own waters to swim in before their next outing. If not, they may find themselves breached on some barren beach. Opening for the headliners were talented locals, Watercolor Paintings, above. At Jensen’s the group set up casually on a side bench and soon had the crowd literally at their feet. While Watercolor Paintings wear their Juno influences (Kimya Dawson, Moldy Peaches) on their sleeves, siblings Rebecca and Josh Redman manage to make their songs their own with inventive harp and baritone ukelele flourishes, Rebecca’s soulful lyrics, and harmonized delivery. A group to watch, as can be seen in a video of their song Telephone Wires found at the link below. 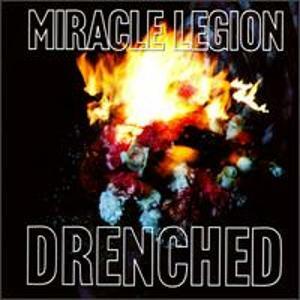 One of our fondest musical memories is catching the great band, Miracle Legion, at Slim’s in San Francisco circa 1992 as they toured behind their masterpiece recording “Drenched.” At Slim’s, frontman Mark Mulcahy and band set the house ablaze with Mulcahy’s manic ravings and the band’s breathless jangle-attack. Last year we caught news that Mulcahy’s wife, Melissa, had died in late 2008 unexpectedly, leaving him to take care of his three-year-old twin daughters. 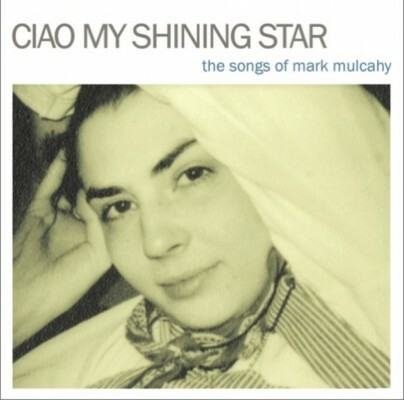 We were reminded of Miracle Legion last September when an incredible lineup of indie rock greats got together miraculously to create, compile and release the record Ciao My Shining Star: The Songs of Mark Mulcahy, a tribute album to Mulcahy and Miracle Legion that served as a benefit for Mulcahy and his family. Amongst others paying homage to Mulcahy and his musical legacy were Thom Yorke, The National, Michael Stipe, Frank Black, Dinosaur, Jr., Mercury Rev, and Elvis Perkins. wait on you hand and foot? And from the tribute record, Ciao My Shining Star, check out The National’s rendering of Ashamed of the Story and Thom Yorke’s read of All for the Best. And then please go buy this record to support Mark Mulcahy and his family. We rendezvoused in Hollywood this past Saturday at the Wiltern Theater to see one of our faves, The National. Once again the band and its deliverances demolished our expectations. 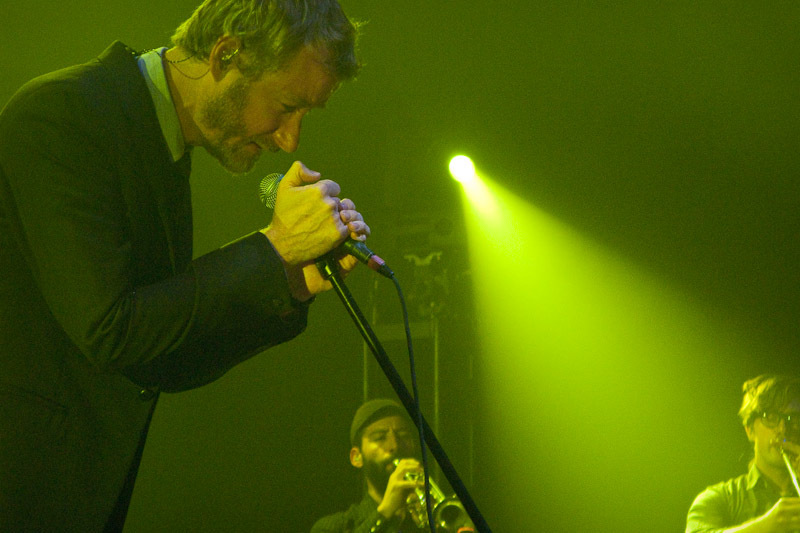 Singer Matt Berninger, the multi-talented sets of Dessner and Devendorf brothers, two horn players, and violinist/keyboardist Padma Newsome sauntered onto the stage with backdrop of moody, monochromatic lighting that perfectly fit the songs and band. We have been listening to their new album, High Violet, nonstop since its release earlier this month, and are happy to report that these new songs made the show for us. High Violet is the record of the year thus far and, as with most of their prior records, the depth and power of these songs continues to grow with each listen. The National kicked off Saturday night’s show with Start a War and Mistaken for Strangers off of their prior, standard-setting Boxer album. With double-horn and keys accompaniment, the sound was full and organic, and the band was striding a great mood. Matt had his usual wine bucket and white wine in hand, and off we went for the National ride. The show really began ti kick in with Bloodbuzz Ohio and Afraid of Everyone off High Violet. Berninger’s repeated refrain in Bloodbuzz of “I still owe money to the money, to the money I owe” captures both the current distressed zeitgeist, but also our nostalgia for less doleful times and and acknowledgment that we can’t sufficiently pay back what we owe to our blood and other deliverers. “The floors are falling out from everybody I know.” Indeed. Too many have fallen. And everyone felt it at the Wiltern. Then it was back to a bevy of Boxer beauties (including Squalor Victoria which was introduced by Matt as almost resulting in a career-ending travesty the night before), followed by more highs from High Violet, including one of our prime picks, Conversation 16. In this song the chorus insidiously intrigues: “I was afraid I’d eat your brains, I was afraid, I’d eat your brains, ‘Cause I’m evil, ‘Cause I’m evil.” And interspersed is the alternately frightening and hilarious: “I’m a confident liar, had my head in the oven so you’d know where I’ll be, I’ll try to be more romantic.” How could he be more romantic, we ask you!? Afterwards, Berninger confirmed earlier reports and marveled that his wife had helped write the lyrics despite the subject matter. At the Wiltern, the crowd screamed the chorus with vigor. 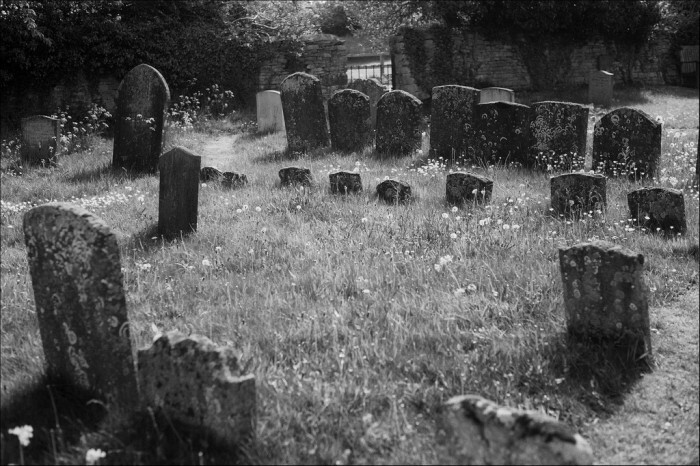 And it made us hope that the gang had not missed Matt’s intent: an acknowledgment and lament for the darkness within. We remain concerned that many of the attendees read it instead as a boastful platform. The world deserves better. After Conversation 16, it was back to the Boxer bailiwick for the well-wrought Apartment Story and Green Gloves before going deep for the always-enjoyable aggression found in the delivery and crowd-participation on Abel. Sorrow and the mighty England followed from High Violet, before the band ended the set with the assured, heartening masterpiece, Fake Empire. In between all of these fine deliveries Matt continued to brandish his always-full wine glass, with progressive aggression aimed towards the bottle and ice bucket, ultimately leading to the spilling of the bucket, and ice and water strewn over the stage, making for dicey footing and peevish looks from other band members. Despite the challenge, the band and Matt managed to navigate the float and flow well through to the finale. The encore was majestic and featured three of High Violet’s strongest songs (Runaway-on which the horns sang with abandon, Lemonworld and Terrible Love), interrupted with the obligatory, anthemic wonder, Mr. November. 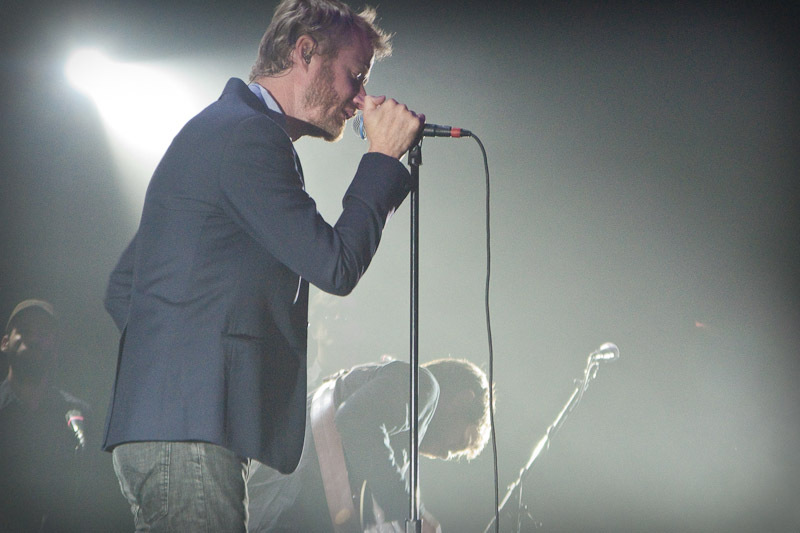 The last time we saw The National at the Wiltern, Berninger came out into the crowd and tight-rope-walked a wall to exhort the crowd, which responded in kind. While this version couldn’t possibly match those heights, Matt gave it his all and then some, and the crowd roared on. Not to be missed. Berninger lives and dies these songs to great emotive effect. The entire band takes the recorded songs way beyond. Do whatever you have to do to catch this band live. And see ’em soon, ’cause you never know. Our one criticism was the glaring omission of two of our favorites from the night’s set: All the Wine and Vanderlyle Crybaby Geeks. We have seen the band on its last three tours and each time they have managed to omit their finest anthem, All the Wine, and its various hilarities. And though we heard Vanderlyle last year, it is amongst their finest songs and was sorely missed. Regardless, The National has established themselves as one of the great American bands live. The next time they head out on tour, make sure that you’re in the audience and ready to get Nationalized. You can thank us later. To make up for the above-referenced omission, give a good, close listen to Afraid of Everyone and Vanderlyle Crybaby Geeks. Sure, we missed catching that other Smiths show at the Palladium in ’86, had to skip that 2nd Radiohead show at the Santa Barbara Bowl in 2001, missed that game-winning, high-arch shot and were properly goated and haunted by that hoops game at Jonata Junior High in 1971, and the list goes on and on. 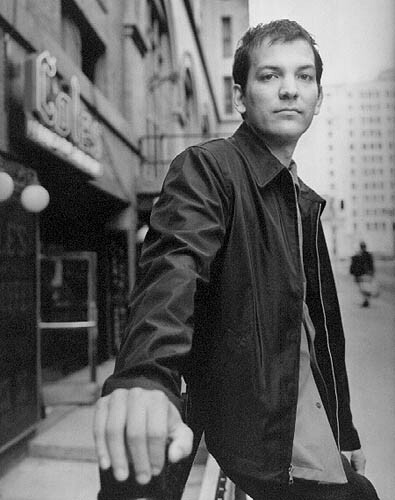 And now we have a couple more regrets and missed shows to add, all relating to one performer: Brad Mehldau. We at Lefort love jazz music, and Mehldau plays seemingly every year at Santa Barbara’s Lobero Theater, including this past year when he and his able band showed on January 22nd. Due to circumstance, circular logic and failed circumspection, resulting in unintended circumvention (and thereby assuring accusations of circumlocution), we have not attended any of Mehldau’s concerts here in Santa Barbara or elsewhere. Oh where does the time go…? Speaking of Radiohead, Mehldau has notoriously covered various Radiohead songs. He’s done Everything In It’s Right Place on his “Anything Goes” record, Knives Out on “Jazzthing: Nonesuch,” Paranoid Android on “Largo,” Exit Music (for a Film) on “Songs: The Art of the Trio, Volume 3” and still others live. The man clearly knows whose compositions are worthy to frame his frequently stunning jazz-musings on piano. In turn, Thom Yorke has said that Radiohead has been honored to have their songs covered by Mehldau. And it’s not hard to understand this mutual respect. Just listen to Mehldau’s recording of Everything in Its Right Place below. Mehldau sets it up and leads off with the beautiful theme of the song, and then from the 2:30 mark until the 7:00 mark, takes the song into serious jazz flight, eventually touching back down into the song’s theme again at the 7 minute mark. A great composition given a ravishing read by one of the great jazz piano players of his generation. In Mehldau’s interpretation of the song, from minute 2:30 to minute 7 of the track, one possibly hears Mehldau encouraging the lovers to hasten their packing and to give flight, and then all hell breaking loose. Regardless, great playing. Also, check out the video of Mehldau and band’s stellar rendering of Radiohead’s Knives Out. 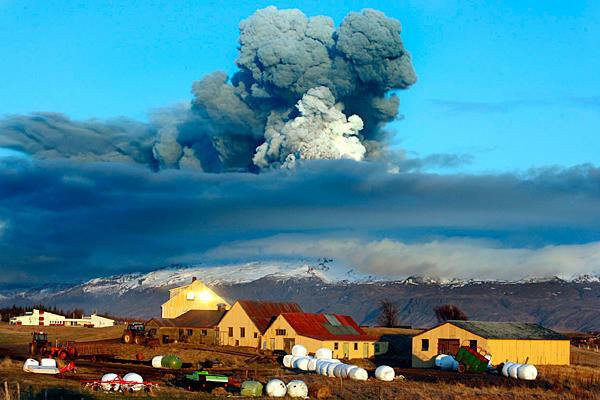 Icelandic bands Hjaltalin and FM Belfast (the latter Icelandic despite the name) deliver some sweet impressions and pop in the face of financial meltdown and volcanic ash. Instructive. Over the years, we’ve hidden in some Harris(on) tweed (Goodwill, Brooks, no matter), and we’ve heeded some Harrison tweets (mainly All Things Must Pass). Combining the two can be disconcerting. 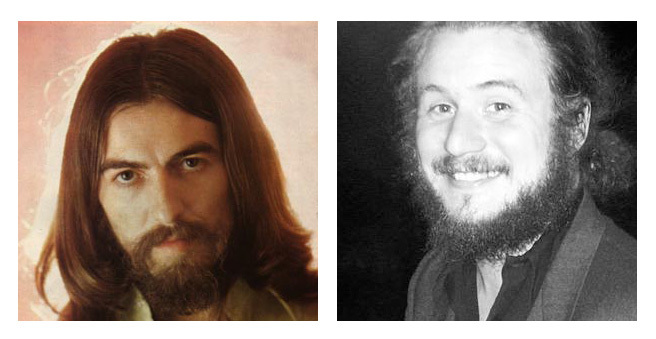 But My Morning Jacket’s Jim James deftly melded with Harrison with the release of his “Tribute to” EP last year. Though only released late last year, James originally recorded “Tribute to” in December 2001 with just acoustic guitar and his standard reverberant vocals on an eight-track reel-to-reel tape recorder just days after Harrison’s passing. With it, James has provided an unfailingly fitting eulogy to George. Yin James has similarly aspired and achieved in these tributes to Harrison. As an added bonus, for those that did not see Todd Haynes’ fine 2007 film “I’m Not There” check out My Morning Jacket’s/Calexico’s beautiful rendering of Bob Dylan’s Goin’ to Acapulo. We have all succumbed to the power of the British rock anthem. Come on–admit it. For some it started with the Beatles’ Hey Jude, for others the Rolling Stones’ Satisfaction, and for others still it was The Who’s My Generation. Or perhaps you came along later and for you it was Mott the Hoople’s All the Young Dudes, John Lennon’s Instant Karma, Bowie’s Heroes, or Queen’s Under Pressure. Still later it could have been the Clash’s London Calling, the Smiths’ There is A Light That Never Goes Out, Joy Division’s Love Will Tear Us Apart, the Stone Roses’ I Am the Resurrection and (we sensed a theme with the Stoned ones) I Wanna Be Adored, Oasis’s Wonderwall, Live Forever, and Don’t Look Back in Anger, or The Verve’s Bitter Sweet Symphony. Still more recently it’s been Radiohead’s Fake Plastic Trees, Paranoid Android, Karma Police, High and Dry, and (yes even) Creep, Blur’s Song 2, Elbow’s One Day Like This, and Coldplay’s ubiquitousYellow and Vida la Vida (does this band do anything but attempt anthems?). We have all condescended to the British anthem, attached our souls thereto and souled the same down that ravashing musical river. But still we have overlooked some. And a band that has delivered some beauties you may not have heard is British Sea Power. We have had a litmus test over the years: if a song forces us to replay it more than five times before listening to another track, then it is likely a classic (in our own minds, mind you) that passes notorious muster (last year we replayed Bell X1’s worthy How Your Heart is Wired for almost an entire drive between San Luis Obispo and Berkeley). Nature’s found a way of telling you that it was going wrong? So which way, do I go to get out of here? Oh, did you wonder if these days will stay true? Take great pains to speak the same language with those you love, no matter where you find yourself. We have fallen short at times. Flying Lotus has just released its new record, “Cosmogramma,” and the accolades are adding up. Mashing electronica with avant-jazz, dance, soul and even chamber-ish string music, Flying Lotus (aka Steven Ellison) has delivered a complex and fascinating melange. We are fond of the 2008 recording, “Los Angeles,” but with Thom Yorke, Ravi Coltrane (yes, that lineage), Laura Darlington, Thundercat and a polyrythmic ping pong ball contributing, Flying Lotus has upped its game. For those given to fly, Flying Lotus is putting on its raved-about rave-up show live this Friday and Saturday (May 14th and 15th) at the Echoplex in L.A. Should kill. In the meantime check out …And the World Laughs With You (with the everywhere Thom Yorke) and Table Tennis (with Laura Darlington).